Veliko Tarnovo University is the only university in Bulgaria, which offers training in Dutch. What is the Dutch program at VTU, what are its components? Yes, the VTU is the only University in Bulgaria, offering a major in Dutch Studies - this is within the Department of Applied Linguistics. It offers two foreign languages, actually. The Department of Philology at VTU offers the study of 18 foreign languages, one of them is Dutch. However, as seen from the wording of your question, in Bulgaria we use two names for the same language - Dutch and Niederlandish, or as I shall refer to it from now on, “Netherlands”. What is the difference? "Netherlands" is the official name of the language spoken in the Netherlands and Belgium. And Belgium, for its part, is a trilingual country, where the official languages are Dutch, French and German. In the Bulgarian language "Dutch" is the most widespread term; however, it is inaccurate, because it relates only to the Netherlands. For the language, we should use the term "Netherlands". In the Netherlands the very word "Dutch" is colloquial, but the noun "Holland" is the name of the province. In northern Belgium, called Flanders, the Dutch spoken there is often called Flemish. It differs in pronunciation and vocabulary somewhat from the Dutch version, but in practice, it is the same language. And now on the curriculum of the major. The training lasts four years and begins with intensive language course in „Netherlands“ language during the first semester. After passing the first practical test of actual language, students begin their studies, which include specialized classes in translation, history and culture of the Netherlands and Belgium, practical grammar, simultaneous and consecutive interpretation, etc. How many students apply and complete Dutch Studies in VTU? Do you have any observations on where do the graduates work? Is there a demand for people who speak Dutch in Bulgaria, or these speakers are oriented primarily to the Netherlands? The classes are of 7-8 to 10 people. They get a diploma for Vocational Training, with which they can end up as an interpreter with two foreign languages. Graduates are great catches, even while studying. In Bulgaria there are already quite a few Dutch and Belgian companies, and Bulgarian companies who partner with those in the Netherlands and Belgium. Many graduates work in the tourism sector, in law firms, in the embassies. Some of them work abroad, but most are in Bulgaria. One strong piece of evidence for the demand for such specialists is the University's Call Center - it was founded by Belgian companies and is the first of its kind in Bulgaria. It is located in Veliko Tarnovo, because there is a special need for „Netherlands” speakers, and we provide the language specialists we train here. These are our students, who have the opportunity to work in their spare time, and thus improve their language. What relations does your department maintain with educational and cultural institutes in the Netherlands? The Veliko Tarnovo University has established a Netherlands cultural center. 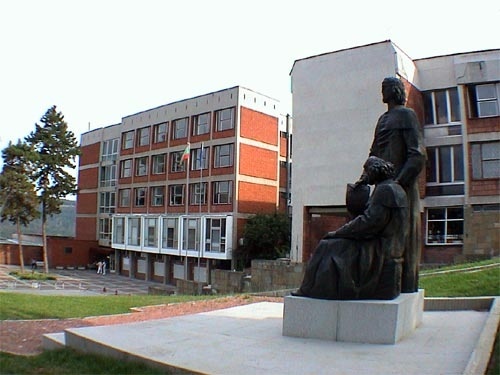 It was founded at Veliko Turnovo University in October 1998, and is the first of its kind in Bulgaria - not surprisingly so, since Veliko Turnovo University is the only Bulgarian university teaching Dutch. The purpose of the Center is to assist students, who have chosen Dutch for their field of expertise as well as to acquaint the general public with the history and culture of Belgium and Holland. It is granted an annual subsidy for books and equipment by the Dutch Language Society in The Hague. Thanks to this financial support and to donations from universities and publishing houses in Belgium and Holland, the Dutch Center now holds about 2 000 volumes (textbooks, grammar books, students’ books, encyclopedias, dictionaries, reference books, fiction), over 70 video and audio cassettes, up-to-date technical equipment. The Dutch Cultural Centre in Veliko Turnovo maintains relations with the following universities, foundations and institutions: the Royal University in Leiden (Holland), the State University in Amsterdam (Holland), the University of Utrecht (Holland), the Limburg University Centre in Haselt (Belgium), the Catholic University of Leuven (Belgium), the Dutch Language Society, the International Society for Dutch Studies, the Dutch Society for Academic Exchange, the Ministry of the Flemish Community in Brussels, the Dutch Ministry of Education, the Dutch Embassy in Sofia, the Belgian Embassy in Sofia. Based on your observations, what is most exciting for Bulgarian students studying Dutch language and culture? That the culture of the Netherlands and Belgium is very different from ours. Opportunities for study and specialization there are attractive as well, of course, even job opportunities in our country are not at all negligible. Would you say that the Dutch and the Dutch culture have influenced Bulgaria in some meaningful way in history? Has there been any impact in the opposite direction? That would not be so easy to point out. Which known, important personalities from the Netherlands are related to Bulgaria? The most famous person associated with the history of the Netherlands was Baldwin of Flanders. With regard to the journalist / writer A. Den Dolard - according to you, should he be considered a friend of Bulgaria or of Macedonia? If you are familiar with his work – does he make a distinction in paying respects to either country? This is a matter for historians. What or where do you think is the common link between the Bulgarian and Dutch cultures? Actually, there are great differences between these cultures. The Netherlands is a relatively small country, but with a glorious past as one of the great colonial powers. It has ruled territories in the Americas, Africa and Asia and this has influenced the mindset of its people. There are many typically Dutch characteristics that distinguish them from us more than they bring us closer. The entire Dutch history is marked by their struggle against the sea, and the conquest of land. This makes the Dutch appreciative of their land, and particularly seriously concerned about environmental protection and about the lack of pollution of nature and cities. Dutch people are very well organized in everything they undertake. They are haracterized by accuracy and compliance with the rules and laws. Dutch sagacity is also a well known personal trait; it stems from their acumen for commerce - for centuries they dominated European trade and the imports from other continents. Very distinct is the Dutch cuisine, which lacks considerably in variation, taste and creativity as compared with the French and Italian. Very different, of course, is the Dutch landscape - from the name of the country, the Netherlands shows that it is a low land, as flat as a platter. The history of our peoples is very different to be able to easily find similarities. As to Belgium, then there the proximity is more tangible. This can be explained by our similar historical destiny. Despite their common spoken language, and the fact that through most of history they have been one country, the Dutch and the Belgians today have a very different mentality.